We did a little test. 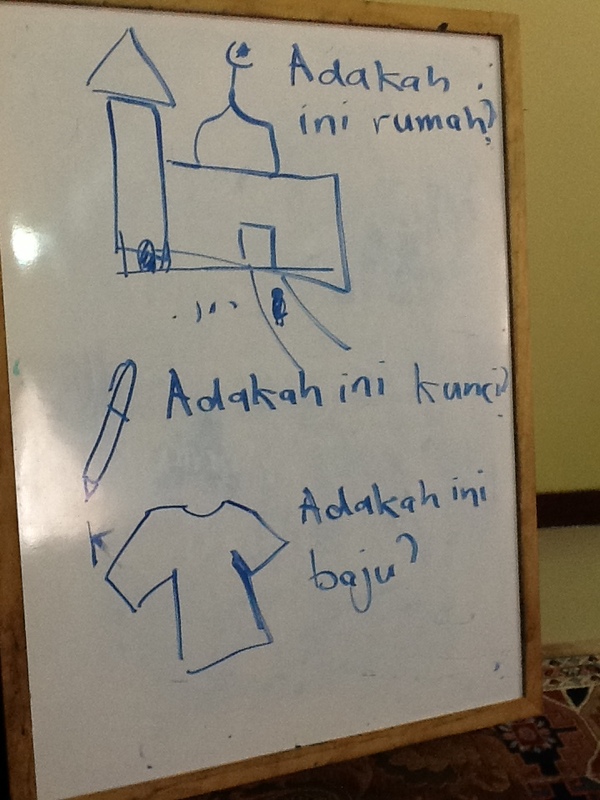 Insya Allah, improving their writing as well. 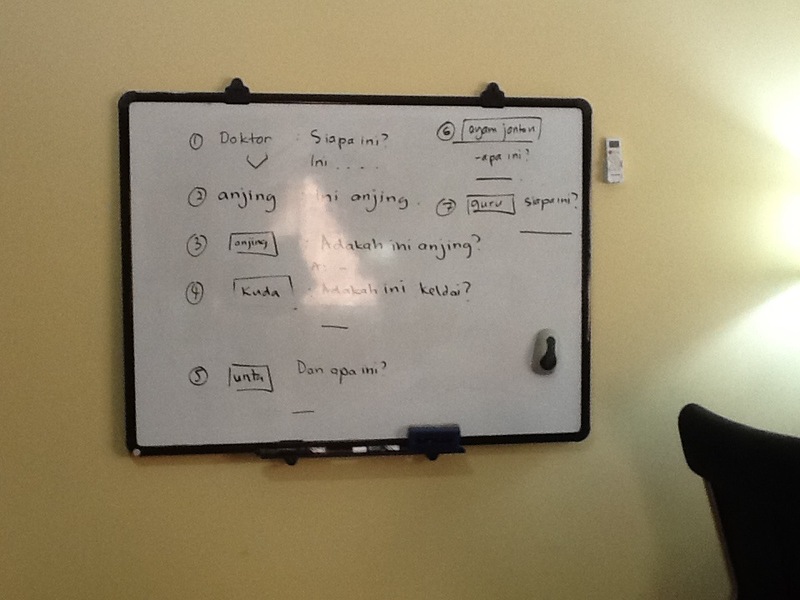 Alhamdulillah we continued our arabic class today. We learn some animal names. Using the Madina arabic book HERE. We also identified the animals as in the Quran. We are following the Madinah Arabic book and you can find what we study today HERE and HERE. I corrected the way they write the arabic letters in our exercise.. We used the white board and also exercise books for the exercise. 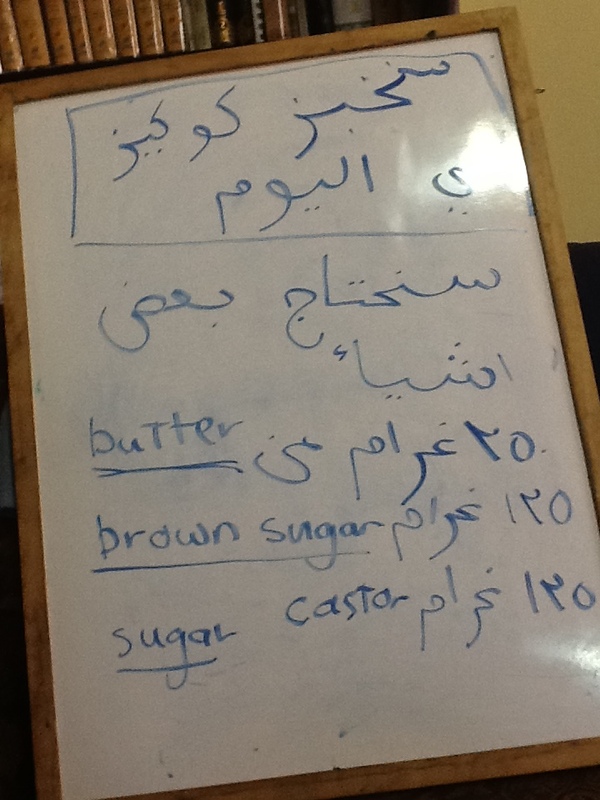 We did some tests from the words we learned in the Madinah Arabic Book. You may find it here and here and here. It was short and fun. I got to correct the way they actually write the letters and also some spelling mistakes. Alhamdulillah. We also make a simple test from our lessons on the CAKE. I write down a simple arabic and asked them to get me the unknown words in arabic. Then come the fun part is to apply it to actual things. What better way to do it than to actually be in the kitchen? 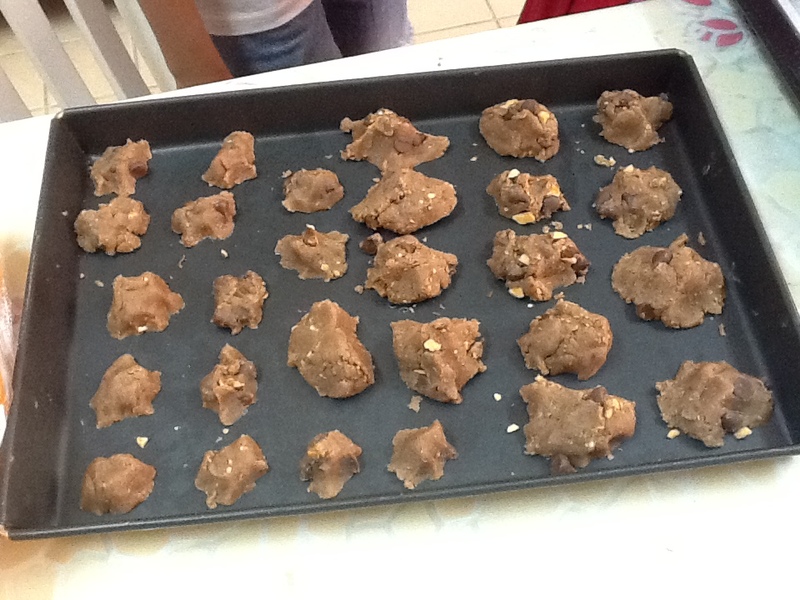 We did not bake cakes though, but instead we made cookies and learn a few new words as well. The cookies come in different sizes. LOL! Then we bring some examples on أ in the quran. I am thinking of introducing Arabic as one of the subjects in our halaqah classes Insya Allah. For my eldest son, he has the opportunity to speak with some of his friends and also his sheikh who doesn’t speak English at all. He is also slowly following the arabic lessons given by Brother Nouman Ali Khan in bayyinah Insya Allah. Once in a while (we haven’t done it for a long time though), we will be following Brother Fahd Al Tahiri in his Sarf lessons. May we be steadfast. 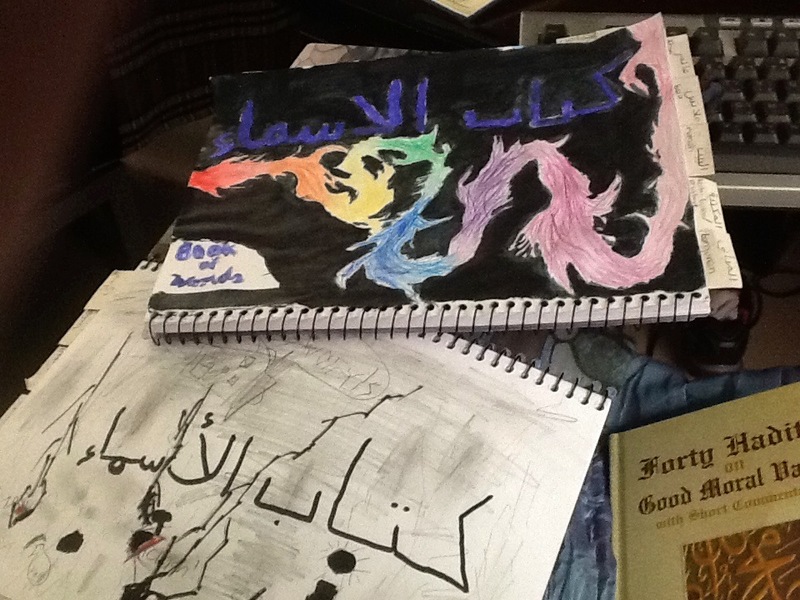 So I am thinking of introducing simple arabic to my other children aged 11 and 8 (in Year 2013). I do not know where to start so have been looking around for a good syllabus and resources. My children can write in the arabic font Insya Allah and can read fairly well if it has harakat on it. However, they do not know what it means like most of us. Allah Mustaan. Nor can they speak the language. I am not so good myself but am slowly taking arabic lessons at a local centre where I live. For now I will be combining the course in the Madinah Arabic books and the resources that I found HERE. 1. Our first lesson is introducing the words هذا and هذه. 2. Then we start going through the vocabularies in the first page of the madinah book. You can find it HERE and HERE. 3. I added some new words based on this cute lesson about The Cake. HERE. 4. I introduced the word ما which means what. I also pointed out the spelling of the words هذا and هذه has no alif after ha even tough we pronounce it long. In the quran there is the alif saghirah to indicate for you to read it long. In standard arabic, there is no alif but we still pronounce it long. Insya Allah they are to familiarise themselves with the words. It is reported in Tafsir Ibn kathir, that this surah is a continuation of Suratul Feel. However the sahabahs wrote “In the Name of Allah Most Gracious, Most merciful” between the two surahs. This is because if the two are combined the meaning would be “We have destroyed its people in order to gather (Ilaf) of the Quraysh. Allah knows best. Makkah was an infertile land. No agricultural activity can take place in Makkah. The people of Makkah depend on business where they travel around to do business. 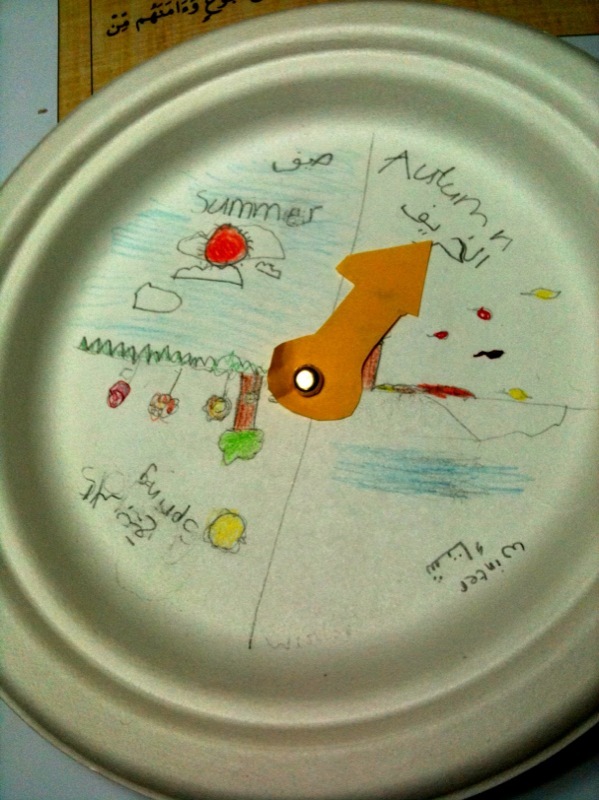 We made a little craft for Z to put the arabic names for the seasons now that they have learned the arabic word for winter and summer. We are currenly in autumn. Alhamdulillah wonderful weather nowadays. The Quraysh took advantage of the seasons in the year to travel. During the hot season of the summer, they would travel to the Shams where the temperature is much cooler. While during the clod season, they would travel to the south where the temperature is moderate. Let’s look at the average yearly temperature around these regions. We will look at temperature in the month of January which represents the most peak winter. And July which would normaly represent the most peak summer. Syria which would represent the northern area yaani the Shams. Refer HERE. I am slightly doubting on the data at Makkah in July. I reckon it can actually hit 50 celcius or at least 40 plus. But the gist is, you can see the best place to travel in the mid summer is to the Shams when the temperature is most moderate. And to take advantage of the moderate winter temperature along the jazeera area. And this was what the quraysh did. This was all by the Grace of Allah. To travel around the Arabia at that time was very dangerous for there are bandits everywhere. However no one dared to touch the Quraysh because of their reputation as the caretaker of the House of Allah. This has become more evident after the year of the Elephants. But they have forgotten that this was a favour given by Allah to them. The protection that the quraysh had when they travel around either during winter or summer are all blessings from Allah. Their elevated status that they are the custodians of Kaabah are also blessings from Allah. Allah continues in the next verse. 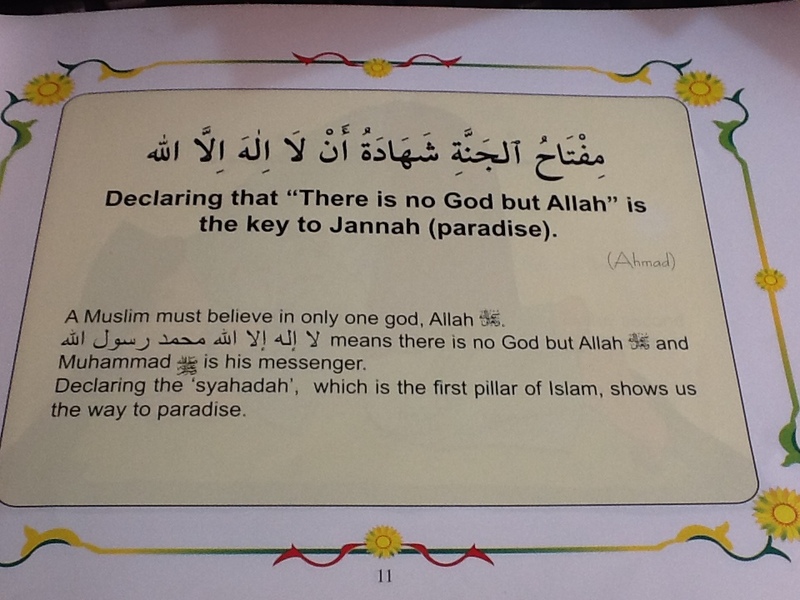 This verse is actually a command from Allah to them to worship Allah, the one who bestows them with all the blessings. Also the one who is the Lord of Kaabah of which the reason of their elevation in status. Allah reminded the people of Quraysh to worship the Lord of the honoured Kaabah. The holy Kaabah that Allah protected from the elephants. Allah has honoured the Quraysh as the custodian of Kaabah. Because of the Kaabah, Allah has raised the status of the Quraysh among the arabs. Even more so after the Year of the Elephants. However the Quraysh, has been worshipping false idols and has placed idols around the holy house. Whereas they know Allah is the one who creates them and the one who provides rizq and the one who protects them. Let us take heed of the lessons. Only ask from Allah. And Only He is to be worshipped. And yet they worship idols who couldn’t do neither good nor harm to them. Let us reflect on our own well being. More so if we have status, or we are born in a good family and surrounded by “noble” people. Do we ever stop and think that these are all from Allah. We must continuously thank Him and continuously doing good deeds that pleases Allah. And thus the custodian of Kaabah was also honoured by the Arab people. The livelihood of the people of Makkah was mostly due to the trades. The Quraysh travel to different places in the season of winter and summer for trade. Allah has honoured and elevated their status such that their traveling was safe despite the rampant robberies and insecurities within the arab world. Allah reminded them of the blessings that He has bestowed on them and that they should worship only Him and not the other deities.